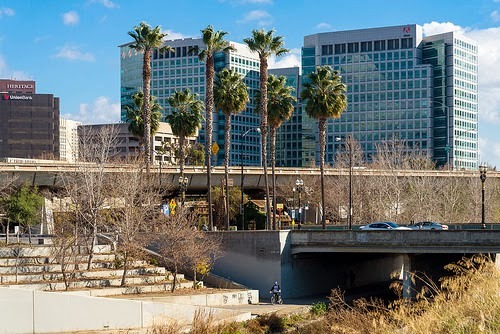 After a year's worth of meetings with developers, business owners, and city government, SPUR (an urban planning nonprofit) has prepared a report detailing how Downtown can leverage its potential and bring more jobs and residents to the area. The meeting to review the report will take place today at the SPUR San Jose office located at 76 S. 1st Street from 12:30pm-1:30pm. The cost for attendance is $10 (free for SPUR members). More info here. Will the report be made public after the meeting? Kevin, that link is for their first report, which was on urban design, not for this one. Mitra, they always make their reports public. Not sure what the publishing date is though. When you see articles like this "How to Make San Francisco Affordable Again", I'm not sure of what to make of SPUR. That article (and a few others) sound like some hard-core Fascist hit pieces. And there is still a subtle condescending tone when SPUR refers to San Jose and Oakland. When you see San Jose being referred to in this way: "However, housing costs remain fairly uneven across neighborhoods, despite San Jose’s proximity to Silicon Valley" (quoted from the article regarding SF adding the most jobs), it just makes you scratch your head. I generally don't take SPUR very seriously. Their ideas are nothing new, and to me SPUR is just another mouthpiece for the San Francisco folks to insinuate their supposed superiority on all matters Bay Area-related. And not all of their articles are condescending towards our city. The SPUR SJ articles are much more cognizant of our heritage, it's just their counterpart in SF likes to do the putdown once in a while. Why don't we wait and read the report, before passing judgement. From what I see, SPUR is very well meaning, well researched, and may have key insight on how San Jose can have a vibrant future. I doubt that they are doing all this just to put San Jose down. Heritage is fine, but only focusing on the past will not drive a vibrant future. Detroit focused on "heritage", and look where it got them. Times are changing, really fast! !, and what we need is open mindedness if we don't want to get left behind like other cities have. I already read most of their reports past reports. Like I said, the SJ SPUR branch seems more cognizant of our city's contribution and heritage, while the SF SPUR branch (which supplies most of the articles on the SPUR site) is always tinged with underlying condescending/back-handed tone towards the other cities. When I mean heritage, I don't mean the past. I mean the contributions and achievements of the city in the timeline that is Silicon Valley's and the South Bay's. No one is focusing on the past, but we should be proud of our contributions and stand up for them whenever anyone attempts to dismiss them. What's wrong with being proud of our heritage and contributions, and voicing concerns when people misrepresent them? Wow. Everyone is so concerned about comparisons to San Francisco. Do you think folks in San Francisco obsess about this? Spur is awesome and does good work. No one is concerned about SF itself, but we are concerned about how SF-centric media tends to sneak in pokes and ribbings at Oakland and San Jose's expense. Greatly appreciated if they would just tone that sh*t down. Please, will someone video tape this "how to make downtown better" meeting and down load it to The San Jose Blog website(this website) for people to watch and hear? It sounds interesting. Given that trend one could argue the roles have reversed. One typically commutes from a suburb to a city.